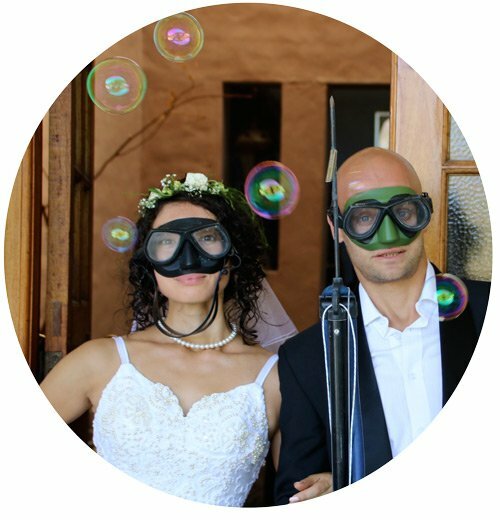 Scuba diving in Cape Town is not really well known around the world. I have been traveling around the world as a Scuba dive instructor for about 5 years. The most common dive questions about South Africa have been; have you done cage diving? and have you dived in the sardine run? Amazing experiences for sure, but South Africa has a lot more to offer to the Scuba diver. With such an diverse coast line it is one of the world’s most interesting diving destinations. 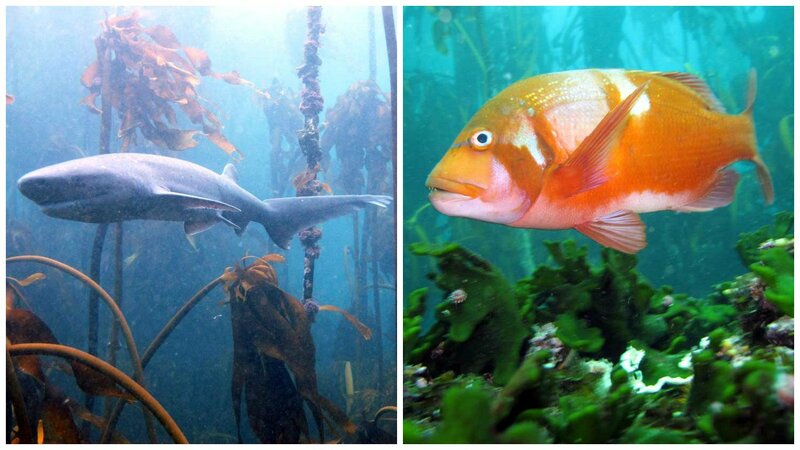 Diving with Seven Gill Cow Sharks and Red Romans in the kelp forests of Simonstown. Diving around Cape Town is challenging. Water temperature vary between cold and very cold and visibility can be poor. But on a good day taking on the challenge is so worth it! Very few people are lucky/unlucky enough to ever see a great white shark scuba diving and attacks are almost non-existent. The cold problem is easily solved by diving in a proper wetsuit or a dry suit in extreme conditions. Diving is interesting and challenging around Cape Town, but is not cheap. We recently paid less than $30 per dive to dive the world famous Komodo Island in Indonesia. This included meals, snacks, very long boat rides and all gear. Compare this with Cape Town which starts at $45 for a boat dive with gear! We paid less than half in Malaysia doing some excellent diving around Perhentian island under $20 per dive! Click Here for some interesting diving we did around the world. Cost of diving with different operators at the bottom of this entry. Many dive sites are easily accessible from the shore. Since no boat costs are involved most training dives in the area are done from the shore. This makes diving cheap if you own your own equipment and know the area, only paying for cylinder refills. Renting is still much cheaper than doing boat dives and many dive shops have dive leaders available for shore dives. Dive sites around Cape Town are either located inside False Bay or on the Atlantic side, referring to the west coast of the Cape Peninsula. There is some fantastic Scuba diving inside false bay. Diving with seals, large 7 gill cowsharks and some very interesting nudibranches. Shore dives are commonly done and the good roads make most sites easy to reach. Many big cowsharks are often seen from the shore. There are a variety of world class wrecks to dive in the bay. Inside False Bay is best dived in winter months when the prevailing north-westerly winds flatten and cleans the bay. In winter visibility is normally between 5 and 10 metres, but I have seen up to 20m. Water temperatures this time of year is normally around 16C. In summer the south easter can spoil conditions decreasing visibility to zero and water temperatures can drop to 12C. Gas Flame Nudibranch, commonly found at many dive sites in False Bay. Dive sites in this area are located in a Marine Protected Area (2004) and a scuba permit is required. It can be purchased from any post office (Kalkbay is an easy one). Tourists can by a 1 month permit (green) for cheap, an annual permit (blue) is about R100 ($7). In a couple of years diving they have checked me once. Not having a permit, you can receive a substantial fine and gear will be confiscated. In my student days we couldn’t afford boat dives and I did hundreds of dives, day and night, from the shore. As an instructor I have trained and showed many divers some fantastic dives from the shore. The “SS Clan Stuart” is a 3500 ton British turret steamer that ran aground carrying a cargo of coal after dragging her anchor in a South East gale on 21 November 1914. The Clan Stuart is an easy wreck to dive from the shore. It is a shallow dive, a short swim and is located in a sheltered bay. This wreck is an easy, shallow dive suitable for all levels. Great shore dive, with adequate parking and well protected from south westerly swell. It is suitable for training and night dives, and has quite a diverse population of reef animals and some interesting wreckage. 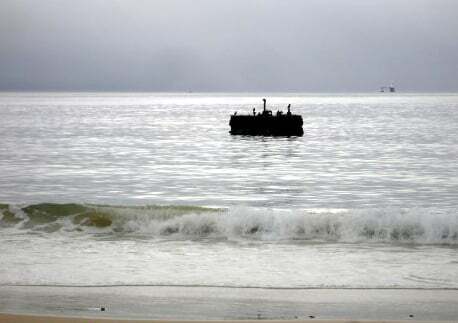 The engine block can be seen above the water from the shore. The wreck is covered in growth, many small fish. Great white sharks have been seen here once or twice. The A-Frame is a very nice shore dive, the entry is easy, there are some interesting swim throughs and a variety of marine life. The entry point is a flat rocky plateau. You decend on a shallow sandy area from where you start your tour through the kelp Forrest and past huge boulders. The biggest cavern/swim through at the A-Frame. There are a few deep holes and overhangs creating interesting swim throughs in which you can see many colorful invertebrates. The smaller of the two rocks has a nice cave to enter filled with big sponges. The site is well suited for night dives. Octopus, cuttlefish, big red romans, hottentot and shy sharks are commonly seen. Black Nudibranch and Cape Silver Tip Nudibranch at A-frame. The site lies approximately 5km from Simon’s Town on the Cape Point Road. Castle Rock is huge rocks in a small bay area, which is formed by big boulders. The dive starts in a small bay which you exit through a big Kelp forest. You swim around the rocks and this site has some amazing fish life. Red Roman, Pyjama sharks, Shy Sharks, Butterfish, Galjoen, Cape Knife Jaw, Bank Steenbras and Janbruin (John Brown) of descend size are seen on most dives. Klipvis, Red Roman and Cape Knife Jaw at Castle Rock. Driving from Simonstown Castle Rocks is situated just before the Cape Point Nature Reserve. After the Millers Point turn off you will see a large outcrop of rocks, Castle Rock. Parking is on the side of the Road, about 15 meters above sea level,so you kit up here and walk down to the entry spot. This is my favorite dive in Simonstown and is often done as a boat dive. Similar fish life to Castle Rock. The highlight is the Seven Gill Cow Sharks. Sometimes many of these large sharks can be seen. They have teeth but in thousands of dives nobody has been bitten. A pyramid shaped rock sticking out above the water between Castle Rock and the Simonstown jetty. Diving in Cape town with Seven Gill Cow Sharks at Pyramid Rock. Scuba diving with the acrobatic Cape Fur Seals is an awesome experience in Cape Town. The seals are very playful and love to show off to divers. These seals are used to divers and many of them often come to investigate and play. Partridge Point is a inshore rocky reef close to Castle Rocks. The amphitheatre, a shallow section of the reef is a good place to watch the Seals. 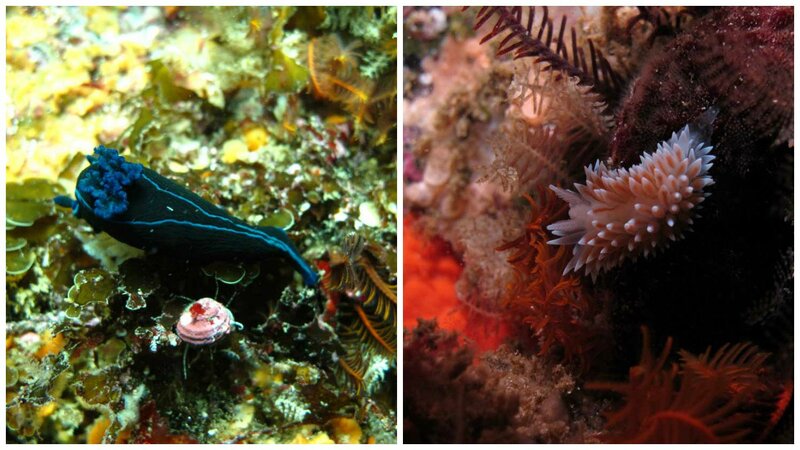 The deeper sections of the reef offers beautiful marine life, swim-throughs and large sea fans. There are extensive kelp forests in the shallower areas, and a heavy cover of invertebrates on the rocks. Rock in False Bay raising from 35m to 3m from the surface. Variety of nice size fish; Red Roman, Red Stump, Yellow Tail and more. Popular spearfishing spot. Great Whites sometimes seen. Nice nudibrances and other invertebrates. Abalone, sea urchins, anemones and a crab on the reef around Castle Rock. Boat dive, 1 km from Millers Point. Princess Elizabeth (fishing trawler) and the Oratava (fishing trawler) The dredger and frigates are in an upright position and at this depth can be quite a ghostly sight. A good charter company is important for this dive, some local divers are not even sure which wreck is which. Grant from Blueflash Divers really knows what he is doing. On the wrecks you can see various nudibranchs, anemones, sponges, sea-fans and soft corals. A good light helps to bring out a lot of color. Because of the depth and cold water be sure to plan the dive well and adhere to limits. Diving the Atlantic Side refers to the sites on the west coast of the Cape Peninsula. Cold, clean water brought by the South East winds makes summer the time to dive here. The South east cleans up the Atlantic side and visibility can reach up to 20m, but then the temperatures can drop to about 10°C. There are some nice shore dives to do from Camps bay in the area. Boat dives launch from Houtbay and there are spectacular wrecks and nice reefs, blinders and pinnacles to dive here on the Western Seaboard of the Cape Peninsula. Plenty of Hottentot is seen when diving on the Atlantic side. This is a very popular shore dive in summer when the water is cold and clean. Large caverns and swim throughs makes this a fun dive. 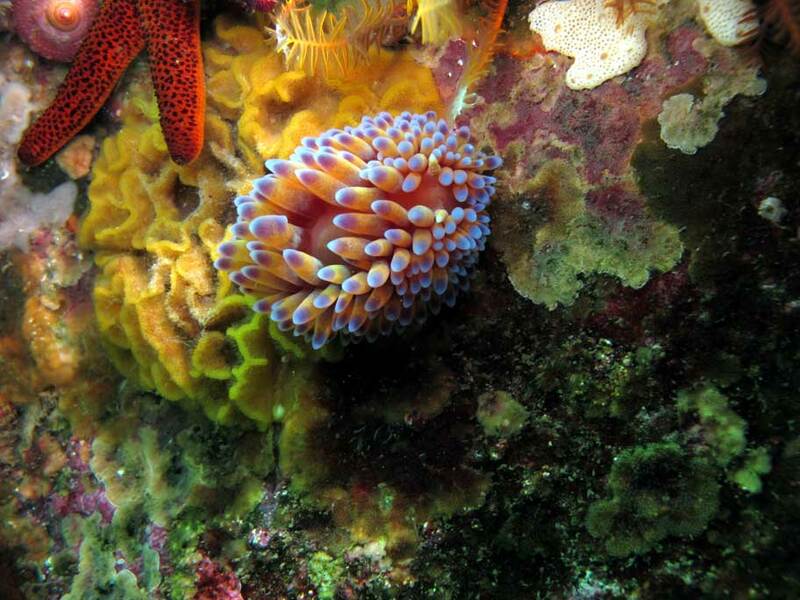 Nudibranches, anemones, sponges and many crayfish live in some of the caverns. Many hottentot fish and small, harmless sharks swim in the area. Many years ago I saw a great white shark here on a shore dive. I have never heard about this happening to another diver. Parking at the side of the road on outside of bend north of the Twelve Apostles Hotel. There is an entry/exit point directly opposite the caves at the bottom of a slope covered with rounded boulders. Dive site about 150m off shore. 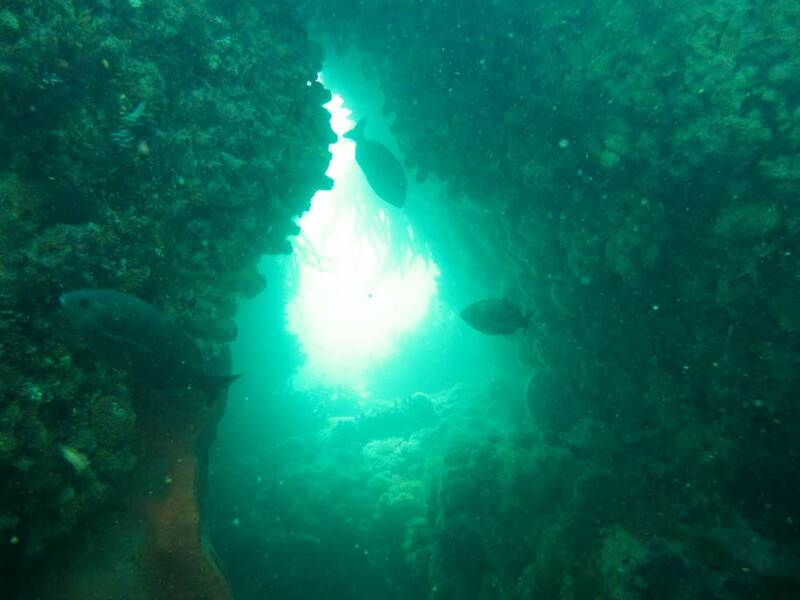 Boat dive, located about 7.5 km from Hout Bay Harbour. Close inshore in the middle of the bay between Duiker Point and Oude Schip, but not easily accessible from the shore as there are no roads in this area. Great Dive Center. Located in Strand, but dives everywhere in False Bay. I did my training with Alpha. Ettienne, the owner, is a great guy with 20 years+ of experience. Good dive masters for shore dives, does boat dives with Blue Flash, an excellent charter company. Pop in for a cup of coffee and discus any diving ideas you might have. Full Scuba gear rental R350 ($25) per day, R90 ($6.50) Divemaster fee. This is a very good deal if you rent a set and refill the cylinder for 2 or 3 dives! Boat fee R200-R300 depending on site, so with gear rental you are looking at about R600 ($44) for a dive. Excellent dive center ran by owner Mike Nortje. 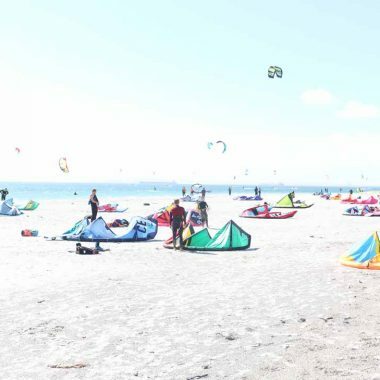 Location is great on Long Beach, Simonstown the most popular training beach. Swimming Pool on site. Nice Coffee Shop in the dive center. 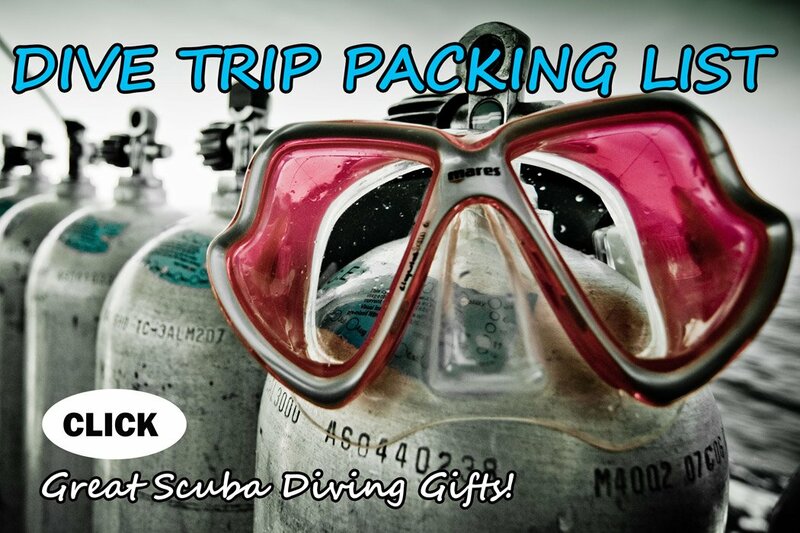 Daily Shorediving package with full equipment, two guided shore dives, lunch and transport from dive centre to dive sites.